This article applies to upgrading to Pega Customer Service from Customer Process Manager (CPM) 6.1 and prior versions. 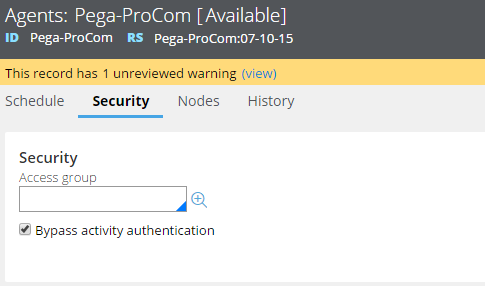 Access the Pega-ProCom instance of Data-Agent-Queue by searching for the Pega-ProCom agent in the Designer Studio search bar. From the Security tab, clear PegaAppAgent from the AccessGroup field.